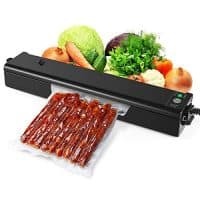 The Rosky Vacuum Sealer is a good choice for a very small segment of consumers, we recommend most people avoid this model and go with the NutriChef PKVS18SL which is a much better value and a lot more useful. See our full review below. No accessory hose or port. No pulse, marinate, or different food modes.. The Rosky Vacuum Sealer is good for people who need an occasional vacuum sealer, AND WILL ONLY BE SEALING DRY FOODS. If you're going to be doing, any Sous Vide Cooking do not by this model, you will regret it down the road. 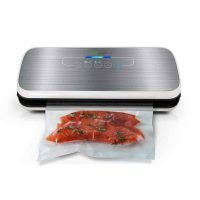 This model is the most manual vacuum sealer we reviewed, it has extras steps found in no other models. You place a bag across the sealer bar they way you do for most vacuum sealers, then on the side it has a manual clamp you need to lock in place before you press the seal button. Once it's done sealing, you need to open a bleed valve so you can unlock the unit. We reviewed 45 different vacuum sealers and this was the only one with a manual release valve. This model has no food settings, no marinate mode, no pulse mode, and no accessory port or hose. It is very cheap, but it doesn't do a lot. If you have very specific needs that this model does, consider it, but 99% of the people should pass this by, it's a purchase they'll end up regretting. Comes with starter kit which includes: (10) Quart-Size Vacuum Bags. Sorry no videos are available for this model. 14" x 3" x 3" 6" x 14" x 3" 15"x 7"x 3"
The Rosky Vacuum Sealer is a low quality product that we recommend you avoid, instead look at the NutriChef PKVS18SL. the VacMaster PRO380 is a specialty commercial grade vacuum sealer with a 16quot; sealing bar.